A 3-day itinerary from Blakeney to Cromer, showcasing the amazing contrasts of this quiet corner of England. A gentle coastal walk from the whispering reedbeds of Cley and Blakeney to the elegant Victorian seaside resorts of Sheringham and Cromer. 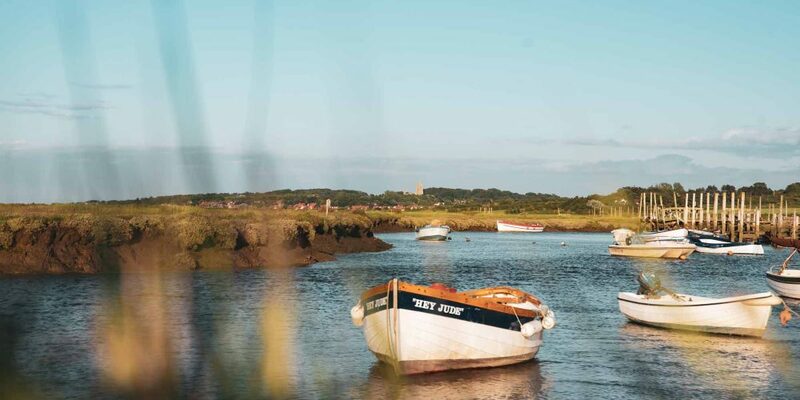 Discover the abundant wildlife making its home on the wildest stretch of the Norfolk Coast, browse among independent galleries and boutiques and sample some of the finest seafood the English coast has to offer. 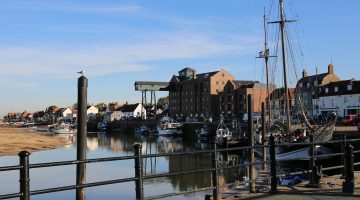 A short three-day walk which showcases the stark contrasts to be found in this quiet corner of England. Start your adventure on the tip of a lonely peninsula where hundreds of seals haul themselves out onto the remote beaches and seabirds wheel on the salty breeze overhead. Revel in the silence and solitude of the saltmarshes where the only sounds are the crashing of waves on the shingle beach and the whistling of the wind through the reedbeds. Indulge in a spot of fine dining in the stylish surroundings of Michelin-starred Morston Hall or pick up a bag of smoked prawns and enjoy a simple picnic on the beach. Take a detour inland on a wonderfully restored steam train to browse among the shops of the picturesque old town of Holt then continue over the undulating sea cliffs to the genteel coastal resort of Cromer – crustacean capital of England. Collect a fresh crab sandwich and wander along to the end of the pier to savour the definitive English seaside experience. The icons below highlight the distance, difficulty and theme of this itinerary. Here's everything you need to help you plan your very own walking adventure. Click on the blue tabs below for more information. To save this itinerary to view later, or to download it as a PDF, use the Save to My Rucksack button at the top of the page. 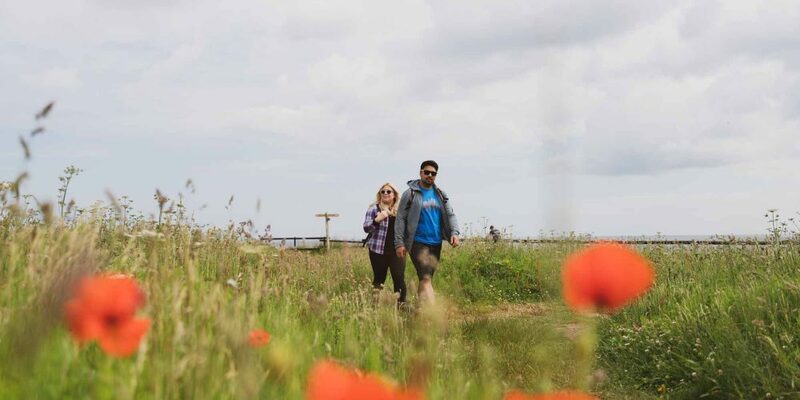 The perfect route for a long weekend walking break, this compact three-day itinerary offers a tantalising taste of Norfolk and includes ample time for further exploration. Extending from the wildest stretch of the North Norfolk Coast to the bustling resort of Cromer, the contrast between the landscapes could not be starker. 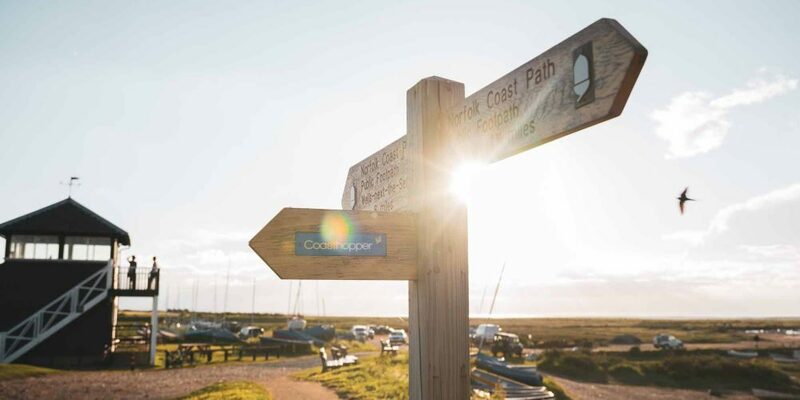 Accommodation on this stretch of the Norfolk coast is abundant and varied, ranging from comfortable campsites to cosy B&Bs and upmarket hotels at both ends of our route. The Coasthopper bus service makes walking each section from a single base perfectly feasible. Train from Stansted Airport via Ely to Kings Lynn (1hr 40mins). Eurostar to London St Pancras then train to Kings Lynn or fly from Schiphol to Norwich International followed by train to Sheringham. Stena Line’s Dutchflyer Rail & Sail service provides city-to-city travel by rail and ferry from Amsterdam/Rotterdam to Norwich, via Harwich International. Then either take a train or bus to north Norfolk. The trail is well-served by the dependable Coasthopper bus service, making it easy to try a different walk every day from a fixed accommodation base or hop on and off the trail to explore whichever sections appeal. The walking on this coast is undemanding but rewarding and these itineraries are designed to combine walking with sight-seeing on foot or by using the Coasthopper bus service. The path can be walked all year round and in the summer months, sunscreen is likely to be more important than stout walking boots. This stretch of the Norfolk coast can lay legitimate claim to offering some of the best seafood on the east coast. Cromer crab sandwiches are a national institution while the smoked prawns on offer at Cley Smokehouse are the sweetest you’ll ever taste. Cookies Crab Shop at Salthouse is another local favourite and the delicatessens in Cley and Holt stock some of the region’s finest produce. The elegant surroundings of Morston Hall combine Michelin-starred sparkle with the very best seasonal, local ingredients to mouthwatering effect. The official guidebook and map for the Trail are available from the National Trails Shop along with a wide range of gifts and other merchandise. View information on the map by ticking the boxes in the Map Filter. Drag the map and use the zoom tool to navigate. Enjoy 5 days of laid-back walking under huge skies and across pristine beaches, visiting cultural highlights along the way. 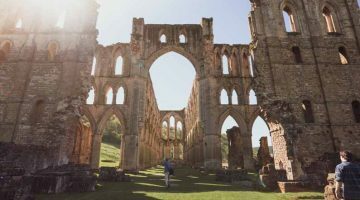 Visit the ancient city of York, the haunted town of Whitby and the dramatic North York Moors over 6 days. 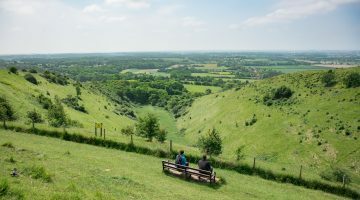 A picturesque walk taking in quaint towns and villages and beautiful Kentish landscapes.